Today was trash day. I never put the cans down at the road the night before because I usually have to scramble to pick it up. Prowling neighborhood dogs find our trash most interesting. Once the can is knocked over, they explore each package, can, and envelope. Things that disappoint them, they shred finer than confetti. So even those who did poorly in school eventually learn not to give the dogs much time to explore. This morning after coffee, I started out to roll the can to the road, when a monsoon hit. I waited five minutes and the sun peeped up over the eastern horizon, casting dappled light on the backyard. Slipping my shoes on, I wheeled the can to the road. After scooping the newspapers from the box and starting up the path, I saw blooming lillies with spring rain drops dripping from the petals. My iPhone was in my pocket so I snapped the photo below. I hope you all have a weekend to remember. Happy Friday the 13th, with the added bonus of a full moon. I planted 5 new lilies late this afternoon. I hope to have a flower bed full of them before the summer is over. I don't have any pink ones like the one in your photo. Stunning!! We don't have stray dogs in our neighbourhood but we have crows and they get in people's trash. I have a huge trash bin that I roll to the curb and the crows can get at the garbage but they get in the recycle bins and pull the plastic bags out of the bin if I don't stick them under the can and plastic containers. They never get in the paper bins cause they can't read. 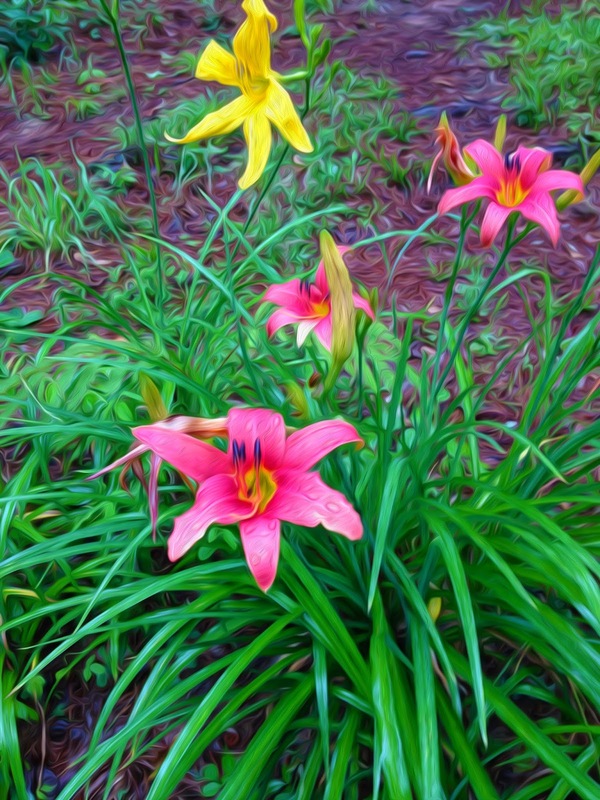 Lilies are one of my favorite flowers. They are so low maintenance. Your lilies are far ahead of mine. Very pretty. I hope that the rain stops soon here too. Great picture..I love seeing your pictures! You really do take interesting photos! Have a great weekend for Father's day. Hey Rick, I did not even remember it was the Friday the 13th until late evening. What a huge full moon last night! Getting ready for our vacation, Hubby and I can not wait to get away! We are in a drought out here and we need green and water!